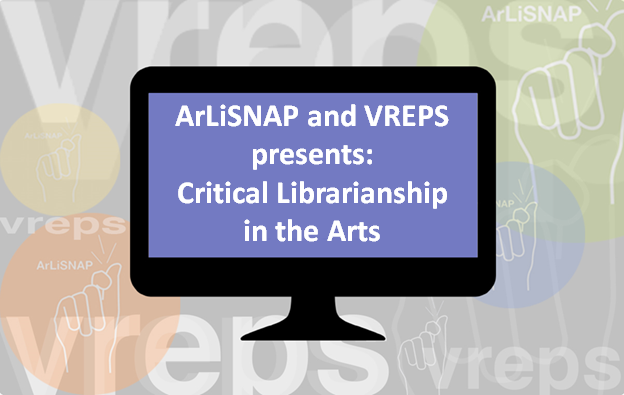 ArLiSNAP (Art Library Students and New ARLIS Professionals) and VREPS (Visual Resources Emerging Professionals and Students) are joining forces to host a virtual conference this Fall! The conference, Critical Librarianship in the Arts, will take place at 1pm CST October 14, 2017. The conference will consist of a keynote speaker followed by 1.5 to 2 hours of presentations by students and new professionals. This is an excellent opportunity for those who cannot be physically present at our annual conferences to share projects and ideas. Our keynote speaker will be Jennifer Ferretti. Jennifer is the Digital Initiatives Librarian at the Maryland Institute College of Art. She is well-known for her “Beyonce’s ‘Lemonade’ and Information Resources” Libguide, which offers different types of resources to interpret and view Beyonce’s visual album “Lemonade” through multiple lens. We have invited her to talk about Critical Librarianship in the Arts and what it means to her. We are looking for students and new professionals with an interest in art librarianship or visual resources management to present their work. The theme for this year’s conference is focused on critical librarianship in the arts. As defined on critlib.org, critical librarianship is “a movement of library workers dedicated to bringing social justice principles into our work in libraries.” Do you have an example of critical librarianship through art that you would like to discuss? Or a unique perspective on how the arts could fight social justice? Submit your proposal, and add your voice to our discussion on the future of the field! Presenters need to be available for a live presentation and brief Q&A session on the afternoon of October 14, 2017. Presenters need to be available for a practice session the week before to test equipment. A date and time for the practice session will be determined at a later date. Submit your proposal via this link by Thursday, August 31st. If you have any questions about this event, please don’t hesitate to contact the ArLiSNAP Co-Moderators, Courtney Baron, courtneylbaron@gmail.com, and Breanne Crumpton, becrumpton@gmail.com.